Over the years, there have been many misconceptions and outright untruths about the auto pawn process. The fact is that this option (sometimes referred to as vehicle title loan) works well for countless Central Florida individuals and families. So long as you have a functioning vehicle with a clean title in your name, you’re eligible for a cash loan. In this article, you’ll learn more about the vehicle title loan process and how you can quickly get the cash you need for home repairs, personal projects, summer vacations, and a variety of other needs and uses. One rumor that has swirled around is that vehicle title loans only work for specific vehicles. This is simply untrue. 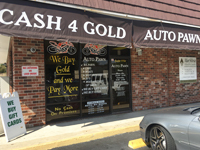 In fact, Auto Pawn has dealt with a variety of automobiles including cars and trucks, motorcycles, boats, and even heavy-duty industrial vehicles. We pawn domestic and import autos, including custom and exotic options. Offering competitive rates and stand-out customer service, we can pawn most any vehicle up to $100,000. In addition, we offer cash for gold and gift cards. 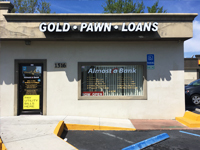 With such a wide variety of options to access funds, we’re proud to have earned the reputation of one of the very best pawn shops in Daytona Beach. These days, it seems like everyone could use a few more hours to complete the many tasks we have on our to-do lists. That’s why it’s essential to work with outlets who won’t waste your time. When you bring in your functioning vehicle with a clean title in your name, one of our skilled and trusted agents will get to work right away to determine the best offer possible. 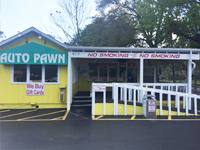 The truth is, we might be the nearest pawn shop to your home. Stop by any of our three convenient Volusia County locations with a valid I.D. and you could be on your way to reaping all the benefits auto pawn has to offer, including hassle-free and fast access to the cash you need, with some of the lowest interest rates in the region. One of the major problems with other lenders is that they seem to want to know everything about your past history. From social security numbers, to credit check, and more, this invasive process can leave even the coolest and most collected person feel like they just got raked over the coals. Spare yourself the embarrassment and humiliation by choosing a pawn shop that treats you with respect and dignity. Here, we know that the value of your vehicle is based on more than the Kelley Blue Book. That’s why our reputable and honest agents make a thorough inspection of your automobile, taking into consideration safety and security features, as well as the overall condition of the vehicle both inside and out. This multi-factor approach ensures you’ll get the very best deal possible. While other pawn shops play games and give customers the run-around, at Auto Pawn we value and respect your time. That’s why our friendly and qualified team members are always up-front about the favorable loan details and stellar terms we can offer. We’re known across Volusia County for our straight-forward approach: no pressure, no secrets, just transparent great deals. Contact us today for more information, or simply bring your automobile into one of our three accessible locations to get started on a customized vehicle title loan.